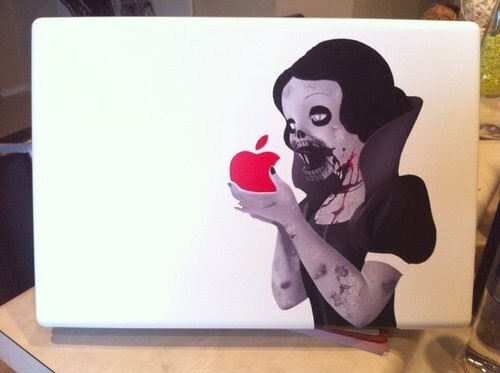 Zombie Snow White on a MacBook? Yikes, this is rather horrifying but very fitting for Halloween. Everyone has probably seen the Snow White decal stuck on the back of a MacBook by now, if you’re a Disney & Apple fan it’s an appropriate tribute to both, and, well, this is a very creepy twist on that. Would I put it on my MacBook? No, I don’t think I would, but then again my personal favorite decal is The Giving Tree, which is a whole lot friendlier. To each there own. Happy Mac Halloween everyone! And thanks to CJ for sending this picture in. Oh, and remember it’s not too late to grab a pumpkin and carve an Apple logo pumpkin or to get a creepy iPad wallpaper. Mac Storm Trooper DJ’s Rocking Out! *Their. To each *their* own.